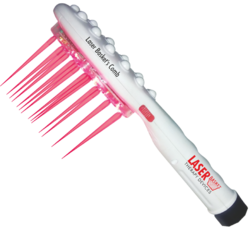 Leading Manufacturer of laser comb for hair regrowth from Delhi. DR CURE AND CARE laser basket's comb has formed to solve the problem of hair fall and care of sclap health may resulet regrowth of hair will take place. Two mode of operation with this handy device which is light in weight, simply battery operated. Vibration give you a good massage and laser diode / led red light will boost scalp and hair health. Wavelengh of 650 nm, which means no harmful side effect. Man and women both can use. Packaging Details: Technical specification for LASER COMB BRAND: DR CURE AND CARE MODEL: LASER BASKET'S COMB COLOUR: WHITE BOX DIMENSION: L-27.2*W-11.8*H-5.3 cm WARRANTY:1 YEARS NET WEIGHT: 300 gms NAME OF THE COMMODITY: LASER BASKET'S COMB PACKING LIST: HOST MACHINE-2 AA BATTERY-MANUAL POWER SOURCE: AA BATTERY MADE IN INDIA MRP-3999/- FEATURE : * VIBRATION MODE FOR SCALP MASSAGE ( ENHANCE BLOOD CIRCULATION) * LASER THERAPY FOR HAIR FALL CONTROL. Looking for Hair Regrowth ?